Welcome to Interviews for Resistance. We’re now into the second year of the Trump administration, and the last year has been filled with ups and downs, important victories, successful holding campaigns and painful defeats. We’ve learned a lot, but there is always more to learn, more to be done. In this now-weekly series, we talk with organizers, agitators and educators, not only about how to resist, but how to build a better world. Saqib Bhatti: I am Saqib Bhatti. I am the Co-Director of the Action Center on Race and the Economy, or ACRE. Sarah Jaffe: We are talking after the week of hell at the Supreme Court where the Supreme Court upheld Trump’s Muslim ban, took away fair share fees from public sector unions and ruled that crisis pregnancy centers can lie to people. I thought I would start out by asking you for your reflections on this week and what it tells us about politics under Trump in this court. Saqib: I think this week we have really seen full force just how much the far right has captured not just the presidency and Congress, but also the Court. I think it was a real wake-up call. After seeing all the decisions, the thing that really sent me to a dark place was actually reading about Kennedy’s retirement. Not because Kennedy is great, but because it really hit home that this is the new norm. That these terrible decisions that are coming out that are really rolling back a lot of progress that we have made over the past two decades. That this is just the beginning. It seems like the corporate class and the white supremacists are now fully in power and it is scary. Sarah: I want to talk in more depth about all of these things. Let’s start with the Muslim ban, because you have been doing research around who supports these things, who the backers of Trumpism on this front are. Saqib:Yes. We have a project at ACRE that we have just launched called Crescendowhich really tries to look at, “Who are the corporations that are behind the anti-Muslim agenda in the US?” We are really trying to hit home that, of course, there are some corporations that are obvious that come to mind like Fox News parent News Corp, Breitbart News, etc. We are actually not focusing on those companies because, frankly, they are a set of companies that are ideologically anti-Muslim. Their bread and butter is fearmongering and hate mongering around Muslims. We are interested in looking at the companies that actually would not necessarily even want to be seen as being anti-Muslim, but that are still directly or indirectly supporting anti-Muslim politicians, anti-Muslim policies or engage in anti-Muslim business practices themselves. We put out a report last week in partnership with LittleSis, which is a research shop that we do a lot of great work with. Among other things, we talked about companies like Wells Fargo and Blackstone and Goldman Sachs that, in addition to being cheerleaders of a lot of Trump’s worst policies, particularly policies that affect people of color, are also some of the major donors to anti-Muslim politicians. So, we really try to connect some of these dots that there are companies that actually count lots of Muslims as customers, yet they are nonetheless actually supporting these anti-Muslim policies and politicians with their money, whether it is direct or indirect. Sarah: We have actually heard a bit in the last few weeks about employees at tech companies, the tech workers themselves, protesting their companies’ involvement in Trump’s anti-immigrant policies, whether it is creating facial recognition or artificial intelligence or something like that. Saqib: Yes, this is one of the really big things that is happening. We think of Silicon Valley as generally a bunch of liberals. Well, it turns out, liberals aren’t actually good on these issues—right? You can be liberal and still actually try to make money off of white supremacy. One would argue that, actually, being liberal means that you typically try to make money off of white supremacy and that comes out clearly with companies like Microsoft and Amazon. These companies try to maintain images as squeaky-clean companies, and they employ a whole lot of immigrants, and they have a whole lot of immigrants who are their customers, as well. But they are actually involved with, as you said, facial recognition technologies, other parts of the surveillance system. There have also been reports from Amazon warehouses of discrimination against Muslim workers. It is one of those things that the image we have of these companies, the images they try to present, don’t actually often match up against their own business practices. And that is the other side of hypocrisy that we want to expose, because we want these companies to know that you can’t have it both ways. You can’t try to present yourself as a good, progressive company at the same time that you are actually very much complicit and helping uphold the infrastructure of Trumpism. Sarah:We also need to look at the Janus decision and the attacks on the labor movement, especially when we are talking about attacks on public-sector unions which is where you have more people of color because of the discrimination in the private sector. Connect that with what we are talking about here. What is it that we see is the through line of all of this? Saqib:What we have really seen is, as you said, huge attacks on communities of color, poor people and people who are vulnerable in our community. One of the under-reported points about Janus is the fact that, yes, it is on attack on unions. But it is really an attack on workers of color and particularly women of color who are overrepresented in the public sector. When we talk about the debate over public pension funds, why are public pension funds so squarely in the crosshairs of the right wing? A big part of it is that public pension funds are a major source of wealth in the black community in places where there are public sector unions. And if you are trying to destroy public sector unions, a big part of that is trying to destroy public pension funds and dismantle that wealth that has been accumulated through workplace organizing in communities of color in particular. What we are seeing is across a range of these decisions that have come down from the Supreme Court, that they are systematically turning back the clock on a lot of progress that has been made on issues of race and immigrant justice. Sarah: This week we also saw a lot of protests and we saw a victory for one in particular, but a couple of progressive candidates who were talking about all of this stuff. In thinking about how to move forward from this, what should we be thinking about? Again, trying to connect the dots so we don’t have a protest against Janus over here and a protest about immigration of here, and a protest about the Muslim ban over there? Saqib:Looking at these issues, it is important to understand who the corporate actors are that are actually bad across all of these issues. The thing that people love to do with the Muslim ban is really beat up on Trump or say, “This is a terrible decision by the Supreme Court.” But the reality is we can raise those concerns all we want and it doesn’t actually hurt Trump for us to say, “He is anti-Muslim, he is racist.” In fact, it actually helps him with his base. With a lot of the politicians, we are seeing that the reason they are actually appealing to white supremacists is because they realize that it helps them. While it is important to call out those politicians for what they are and what they are doing, we can’t stop there because at the end of the day that is not going to be an effective way to move them. Especially now, we are seeing that the Supreme Court in the coming years is likely to be stacked by far-right ideologues. That is why it is truly important to look at the corporations these politicians are beholden to. What are the corporations whose agenda the Supreme Court is carrying out? We need to really show some of these connections. What we have found in our research is that a lot of the same companies that are profiting off the mass incarceration system, that are really profiting from our immigrant policies, that are supporting politicians that are anti-Muslim and support policies like the Muslim ban, are actually a lot of the same corporations. And by the way, those are also the same corporations that are responsible for defunding the public sector, because they don’t pay their fair share in taxes. Across the board, we see the financial sector, in particular, emerges as a major form of power that is really driving a lot of these terrible practices. Companies like Wells Fargo, JPMorgan Chase, Bank of America, they all finance private prisons and immigrant detention centers. They are all some of the major campaign contributors, either directly or through with the American Bankers Association, financing some of the most anti-Muslim politicians out there. Wells Fargo is a major corporate beneficiary of Trump’s tax cut. Then, we need to use that to polarize against these elected officials. That these elected officials, like Trump, are actually doing the dirty work for these other corporations that want to maintain their own squeaky-clean image while remaking the world in a way that suits them—at the expense of communities of color. Sarah: On that note, the most hopeful note last week for a lot of people was the success in Queens and the Bronx of Alexandria Ocasio-Cortez who, notably, did not raise a lot of money. She did not take any corporate money and she ran on a platform that included abolishing ICE, a jobs guarantee and a Green New Deal. What does that tell us about the possibility of actually beating the same corporations that are backing Trump? Saqib: I think that there is more potential now than ever before to actually beat these corporations. I think that is why we are seeing such a big push to try to cement control over the Supreme Court as a fail-safe for these corporations in the long run. I think this was recognizing the tide is turning against them. 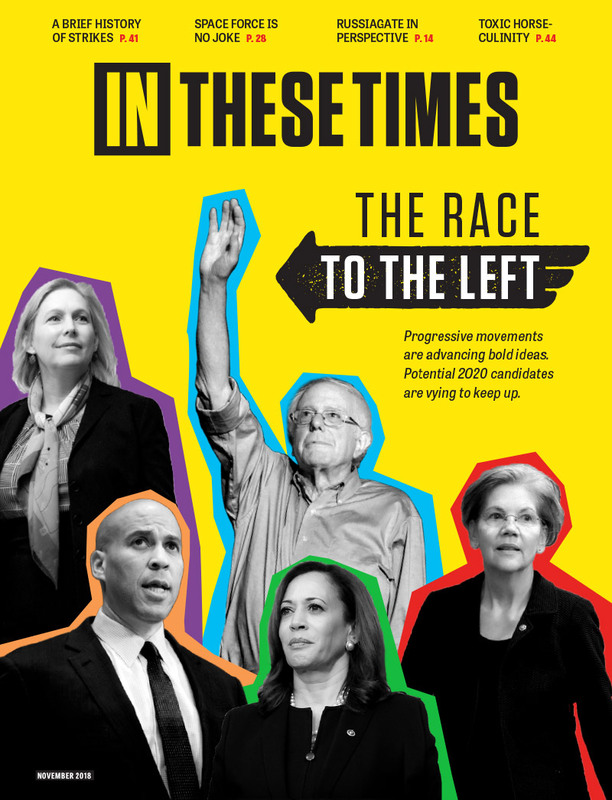 We are seeing in place after place, the corporate Democrats really sort of faltering and the rise of more leftist politics within the Democratic Party, which is great. I am actually hopeful, despite everything else. I am hopeful about Alexandria Ocasio-Cortez’s victory, and I am seeing more things like that going forward. I live in Chicago. In 2015. Rahm Emanuel outspent Chuy Garcia by a magnitude of roughly 11 to 1 in the initial primary election. Chuy was able to push Rahm to a runoff and had a real shot there. I think what we have started seeing is a gradual shift to the left. I think the Democratic Party has not caught up. I think they are digging their heels and trying to block that progress because they are beholden to these same corporations that under Bush decided, “Oh, okay, the Republican Party is moving too far to the right, so we should double down on the Democratic Party.” At the end of the day, what we are seeing is that the electorate continues to move further to the left and that is why they are trying to cement this control at the very least at the Supreme Court level so that even as the electorate changes, that they can try to block progress. I think that will definitely be a losing battle for them in the long run. Interviews for Resistance is a project of Sarah Jaffe, with assistance from Laura Feuillebois and support from the Nation Institute. It is also available as a podcaston iTunes. Not to be reprinted without permission. Will Dems Fight the Nomination of Brett Kavanaugh? Organizers Are Pushing Chuck Schumer To Act.